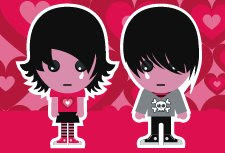 blogkoto: on my "being emo"
Wow, you are a Little Bit Emo! Shop at second hand stores from time to time? Feel like no one understands you? Own a pair of Chucks? That's just what we thought. It's not very strong, but we can kind of see it. We're betting you mope from time to time and you've been known to sigh over an ex, even if you only do it where no one can see you. Come on, just admit it — brooding can be fun. Thank your lucky stars, because you'd never, ever wear as much makeup at Pete Wentz or listen to Taking Back Sunday all the time. Maybe you just like to pretend that you're super-stoic, but we know that deep down you've got a heart of purest glass. So congrats — you're not totally tragic. Not even close.